See dimensions in diagrams below. 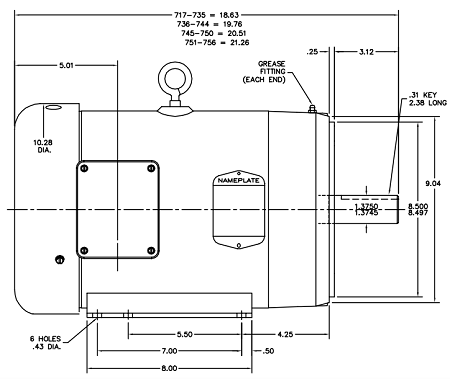 The CEM3714T motor replaces Cat. CM3714T (Spec: 37G814S275H1) and also Cat. 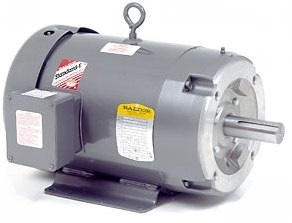 CM3774T (Spec: 07C152X761H1) Production of both of these motors has been discontinued by Baldor. Electrical: 208 - 230 / 460 VAC, 3-Phase, 60hz. Amperage: 25.4 Amps @ 208 Volts, 24 Amps @ 230 Volts, 12 Amps @ 460 Volts. C-face: designed for mounting a "pump to motor" adaptor. 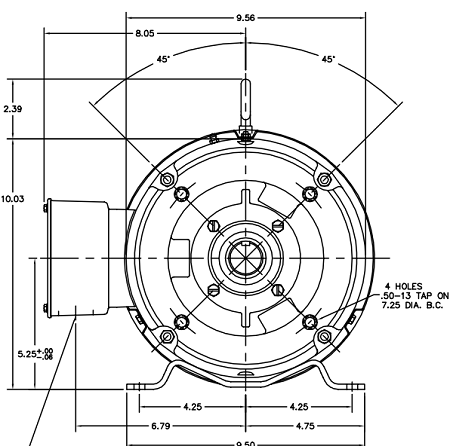 Shaft: diameter 1 3/8", length 3 1/8", keyway 5/16". Reversible rotation. Enclosure: TEFC, totally enclosed, fan cooled. Overall length of motor: 18.63".